Experience Rollins, a place where you belong. 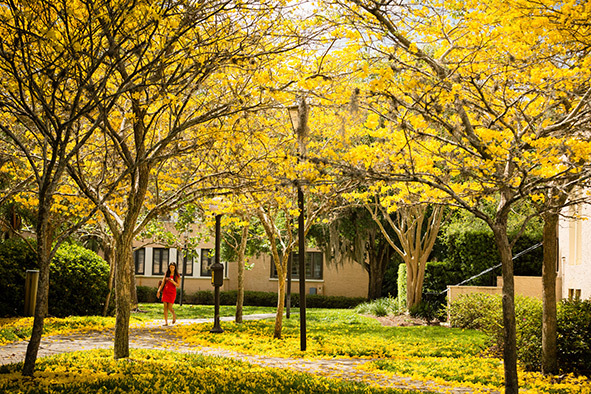 On behalf of the Rollins community, it is a great pleasure to welcome you! As an employee of the College, you will have the opportunity to play an integral role in helping the College community achieve success through its commitment to excellence and innovation. We have prepared this website to provide you with a general overview of the College and answer questions you may have as a new employee. Please read through the information provided and use this website as your link to various resources offered to Rollins College employees. You will find it a useful guide to many departments, programs, benefits and services. We take great pride in offering an applied liberal arts education that prepares students to pursue meaningful lives and productive careers. A Rollins education empowers students to strive for excellence, cultivate intellectual curiosity, develop critical thinking, become responsible leaders, and engage in the world around them. Rollins faculty are a community of teacher-scholars, artists, and performers who are nationally and internationally recognized for excellence and their commitment to student-centered learning. Faculty and staff work with students to develop an integrated experience to link in-class learning with unparalleled applied opportunities such as hands-on undergraduate collaborative research, academic internships, national award-winning community engagement and first-year programs, as well as inspiring international experiences. A Rollins education exposes students to a broad range of knowledge that transcends disciplinary boundaries and the traditional walls of the classroom. Rollins’ Service Excellence Initiative strives to improve how we treat our students, visitors to our campus and our colleagues. Responsive, respectful, competent and collaborative were identified as the College’s four service standards by Rollins President Lewis Duncan and his extended leadership team. The service philosophy and service standards help delineate what we consider important as we engage in our work and with each other, as colleagues, to deliver a seamless service experience to our students and customers. As we aspire to achieve higher levels of excellence and strategically market Rollins’ unique value, our success will ultimately depend on how effectively we can deliver on the promise of a distinctive, transformative, and engaged learning experience that is truly exceptional and unique. It is our goal to make your employment at Rollins College a satisfying and rewarding experience. We value our employees and strive to be respectful of their concerns, responsive to their needs, and committed to their success. You can assist us in this undertaking by communicating with us regarding your experiences and your perceptions of the working environment. Thank you for your contributions in support of the College. If there is anyway we can be of assistance to you, please feel free to call on us.